South Africa head coach Rassie Erasmus. 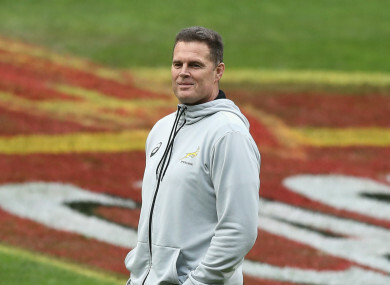 SOUTH AFRICA HEAD coach Rassie Erasmus has rejected claims he will take control of the Bulls for the 2019 Super Rugby tournament. The Bulls have not performed well in Super Rugby since 2013 when they were beaten semi-finalists, and finished bottom of the South African Conference this year — winning six of their 16 matches. Pressure has grown on coach John Mitchell, who has been linked with a role with England, as a result and reports on Saturday suggested Erasmus could help out next year. However, the 45-year-old former Munster director of rugby – who has previously coached the Cheetahs, Stormers and Western Province – insists any assistance will be purely as part of his role with the Springboks. “No, I am not planning to coach the Bulls,” he said ahead of South Africa’s departure for their Rugby Championship double header against Australia and New Zealand. “It looks funny because it’s not an official thing. For example, Jacques Nienaber and Pieter de Villiers toured with the Stormers and the Lions and I was with the Sharks. “Overall, we are trying to help everywhere we can and if the Bulls want some help for a few months then it is part of my job as director of rugby to help them. Email “Erasmus focused on Springboks amid Bulls talk”. Feedback on “Erasmus focused on Springboks amid Bulls talk”.